Air filters are extremely important in maintaining a good working pneumatic motor by removing condensed water and foreign particulates. The compressor-supplied air enters the filter and travels through 7 layers of filter material before exiting through the outlet port. Both have pressure gauges, relief valves set at 125 psig and output lines of 3/8″ NPT (Fem.). 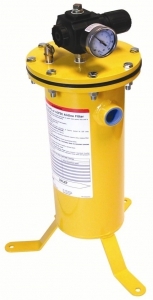 These stand alone filters also act as a reducer for larger incoming air lines. The 2 line model weighs 24 lbs. while the 6 line model is 28 lbs. HoverTrowel has requisitioned Jenny/Emglo to manufacture portable air compressors to our specifications and Ingersoll-Rand’s low torque motor requirements. These compressors are performance-rated and designed to provide years of efficient and reliable service. There are two models available 230 volt that can be configured with a three-phase 460-volt motor on special order. The Jenny model G5A-38P is a 4-cylinder, single-stage unit mounted on a 30-gallon ASME code receiver. Powered by a 5 HP motor, this compressor delivers 18.3 CFM of air at 100 PSI. The unit is available with either a single-phase 230 volt motor or a three-phase 460 volt motor. Both single-phase and three-phase models include a motor starter and on/off switch as standard. The 30-gallon portable design is well-balanced for ease of movement. A 3/8 NPT regulator and gauge assembly is mounted for easy connection to the air hose. Ideal for HoverTrowel’s low torque pneumatic power trowel. 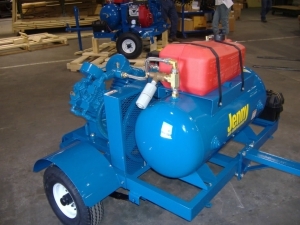 The Jenny model J5A-30P is the biggest electric-wheeled portable compressor available. This four-cylinder pump comes mounted on a 30-gallon ASME portable tank. 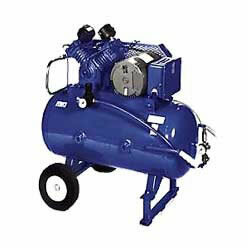 Its 5 HP motor is able to deliver 25 CFM of air at 100 PSI. 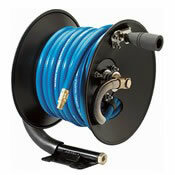 The unit is available with either a single-phase 230 volt motor or a three-phase 460 volt motor. Both single-phase and three-phase models include a motor starter and on/off switch as standard equipment. This heavy-duty 30-gallon portable unit has 10″ diameter pneumatic tires for easy movement at the job site. Ideal for HoverTrowel’s low torque pneumatic power trowel.